ISR Professor Carlos Berenstein (Math/ISR) is one of five inventors who have been awarded US Patent 7,424,463 for "Denoising Mechanism for Speech Signals using Embedded Thresholds and an Analysis Dictionary." Along with Berenstein, the inventors include ISR alumni David Walnut and Domenico Napoletani, along with Timothy Sauer and Daniele Struppa. The invention is a denoising mechanism for signal processing that uses chosen signal classes and selected analysis dictionaries. The chosen signal class includes a collection of signals. The analysis dictionaries describe signals. 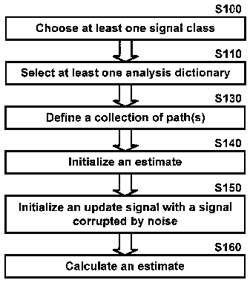 The embedding threshold value is initially determined for a training set of signals in the chosen signal class. The update signal is initialized with a signal corrupted by noise. The estimate calculated by: computing coefficients for the updated signal using the analysis dictionaries; computing an embedding index for each of the path(s); extracting a coefficient subset from coefficients for the path(s) whose embedding index exceeds an embedding threshold; adding a coefficient subset to a coefficient collection; generating a partial estimate using the coefficient collection; creating an attenuated partial estimate by attenuating the partial estimate by an attenuation factor; updating the updated signal by subtracting the attenuated partial estimate from the updated signal; and adding the attenuated partial estimate to the estimate.